The aim of the present study was to compare, in 36 highly-trained under 15 soccer players, the respective effects of age, maturity and body dimensions on match running performance. Maximal sprinting (MSS) and aerobic speeds were estimated. Match running performance was analysed with GPS (GPSport, 1 Hz) during 19 international friendly games (n=115 player-files). Total distance and distance covered >16 km/h (D>16 km.h-1) were collected. 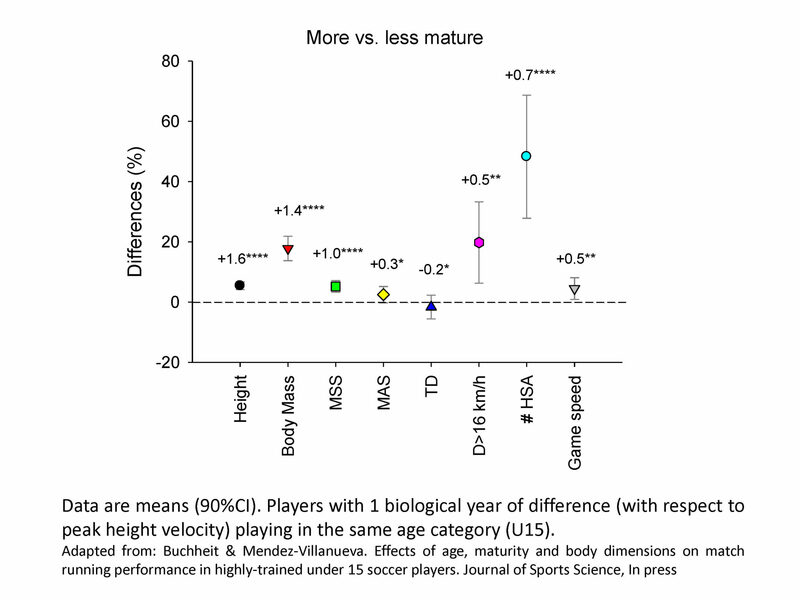 Players advanced in age and/or maturation, or having larger body dimensions presented greater locomotor (Cohen’s d for MSS: 0.5-1.0, likely to almost certain) and match running performances (D>16 km.h-1: 0.2-0.5, possibly to likely) than their younger, less mature and/or smaller team-mates. These age-, maturation- and body size-related differences were of larger magnitude for field test measures vs. match running performance. Compared with age and body size (unclear to likely), maturation (likely to almost certainly for all match variables) had the greatest impact on match running performance. The magnitude of the relationships between age, maturation and body dimensions and match running performance were position-dependent. Within a single age-group in the present player sample, maturation had a substantial impact on match running performance, especially in attacking players. Coaches may need to consider players’ maturity status when assessing their on-field playing performance. % are not enough to assess the magnitude of an effect | Any comments?